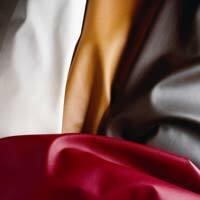 Touché is a 100 percent urethane upholstery pattern from the company’s Boltaflex contract upholstery line. The product has a soft hand and “kid leather” grain, making it a cost-effective alternative to leather and other polyurethanes on the market, according to the company. The product comes in 27 standard colors, featuring a broad neutral palette as well as signature solids. Custom colors and weights are available on a minimum yard basis.